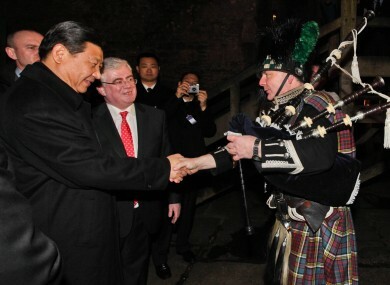 Chinese Vice-President Xi Jinping and Tanaiste Eamon GIlmore meet piper Neil Carey at Bunratty Castle. TWENTY YEARS, two premiers and two future Presidents. Why do China’s leaders love visiting Shannon? Last week, Chinese Vice-President Xi Jinping flew into Shannon airport, met with Shannon Development executives, and went out to dine at a medieval banquet at Bunratty Castle, just off the motorway connecting Shannon and Limerick. The heir apparent to the Presidency of China tucked into the hearty Clare fare and took in the traditional dance and food, and took in some chit-chat from Ministers Eamon Gilmore and Michael Noonan, who sat with him for dinner. It is hoped that he had fun. Now unless you have a deluded idea of the importance of Ireland (let alone Sixmilebridge) this evening should beg an obvious question: what on earth was the heir apparent to the world’s second largest economy doing in Ireland, in Clare, and meeting Shannon Development, a local Irish agency you probably don’t hear about very often these days? And why the medieval banquet? Which should beg another question: why, in the past 20 years, have all the following powerful Chinese leaders come to Clare and requested meetings with Shannon Development: President Jiang Zemin; Premier Zhu Rongji; Premier Wen Jiabao; Vice Premier Huang Ju and Vice Premier Zeng Peiyan? To answer that question we have to go back to 1980, when in global terms, the People’s Republic of China was an economic minnow, still emerging from the shock and destruction of the Cultural Revolution. Moderate, modernising forces had taken control of the Communist party following the death of Chairman Mao. They were searching for new ideas to help build China’s economy. And that search had taken them to the town of Shannon. Meanwhile, by the 1970s, Shannon and Ireland’s midwest were shining examples of what international investment and smart local development could achieve. Shannon Development and its allies had invented the duty-free zone, won special local investment tax breaks, minted strong US relationships, focused on practical third level education, and enjoyed an investment-friendly tax and regulatory system. Back in China, Deng considered the creation of special economic zones, where overseas investment would be permitted. In 1980, a younger reformist, the engineer Jiang Zemin (who was to become President from 1993 to 2002) and a clutch of other Chinese officials were dispatched on a world tour to see how special economic zones worked in other countries. After a touring several other countries, that journey eventually landed them in Shannon. The visit was to be something of a revelation. The delegation was introduced to the world’s first duty free shop, an airport-focused infrastructure, and a special zone of low tax and free trade. They welcomed the pragmatic approach of Shannon Development. Unlike all the other countries Zemin visited – most of which had a stake in the cold war – Ireland was not touting an ideological agenda. The officials in Shannon were focused on jobs creation, practical education and transfer of skills, and facilitation of each new company’s needs. This was a cat that could catch mice. After touring various economic zones around the world, the Shannon model and that of Singapore were the only two that the Chinese decided to follow. “The place that apparently impressed [the Chinese] the most was the Shannon industrial duty-free zone. I’m told they were also very impressed with the informality of their Irish hosts, who took them to Durty Nellies pub afterwards for a sing-song – which may explain the warmth with which the Taoiseach Bertie Ahern was greeted by President Jiang in Beijing in 1998. So what were some of the unique lessons that the Chinese took away? Dr Wang Liming, Director of the UCD Confucius Institute for Ireland, has identified some of the lessons from Shannon that were to prove invaluable for China. Locate away from the seat of power. Shannon Development being far from Dublin meant its executives had some autonomy in decision-making. Locate close to a transport hub. Aside from logistical benefits, exposure to foreign (US) business practices and visitors helped Shannon “see capitalism in its most vigorous form”. Use special tax rates and other means to get inward investment, but also nurture domestic business. These and other principles were put into place when the special economic zones were established. The zones were to become a major driver for China’s economy, allowing private investment to flow into the country, and a massive transfer of skills and technology to take place. The establishment of Shenzin, the first town modelled on Shannon, was a turning point in China’s economy. The city of Shenzin (1980 population: 25,000) now has a GDP similar to the country of Ireland. All of this explains why a trip to Shannon is something of a pilgrimage for China’s political elite. A journey back to where it all began, Bunratty medieval banquet and all. I hope that Mr Jinping was also treated to a good sing-song in Durty Nelly’s last week. It may have mythical status in China’s communist party as the highest honour our country can bestow. Well first, the Chinese are damn good at copying things. Which we all should be these days. The reality is that copying an idea and improving it accounts for 99 per cent of business innovation. Steve Jobs would agree. So would Michael O’Leary. Or Bill Gates. Or Warren Buffett. It does seem like we lost something along the way though. We went from being the innovators to watching others really show what could be done with our ideas. So this is probably the bit where I should hark back to the good old days before the Celtic Tiger, when men could turn an estuary marsh into a world model of export-led growth. Back before we all became indulgent tiger cubs high on property crack cocaine, shopping in New York, etc, etc. But harking back to the old days is not a solution, it’s just a fashionable way of ending speeches and newspaper columns these days. And it’s so unhelpful and patronising it makes me want to do violence to the pundits and politicians who trot it out. The truth is that the success in Shannon was driven by practical thinking. There was no left or right wing ideology – only application of what worked. Sometimes that meant revolutionary ideas won out in Shannon, simply because they were the best. Practical thinking does not exclude brave thinking. It does exclude consensus thinking. It’s exactly what drives good business innovation, and probably all good innovation. Being practical isn’t just a buzzword: it has consequences. It means measuring results and owning up to failures. We should be willing to test what’s working in terms of job creation and solving our social problems, and funnel resources that way. And when projects or policies don’t work out, close them down. Put the resources into what works. To find what works, Ireland should allow some room for experimentation – on a policy level, or a local level, like in Shannon. We probably don’t need the tax-raising and cost-cutting experiment being mandated by the self-interested and ideologically hidebound Troika. They have a theory that a black cat – austerity and privatisation – is best for us. But, to paraphrase President Deng, that idea does not seem to be catching any mice. Shannon happened with a dedicated local team making their own rules away from Dublin’s daily supervision – and building a global model. Could that be done in Ireland today? Paul Quigley is co-founder of Newswhip.com, an Irish start-up tracking how news spreads through the social web. Email “Why do China's leaders love visiting Shannon?”. Feedback on “Why do China's leaders love visiting Shannon?”.